Lauren is originally from Fresno, California. She was a member of the program from 2001 until 2005. Lauren served as program President for three years, during which the program went from never having advanced from regional qualifying to coming a tiebreaker away from appearing in the national championship round in 2005. In 2004, Lauren was named an All American attorney at the National Championship Tournament. 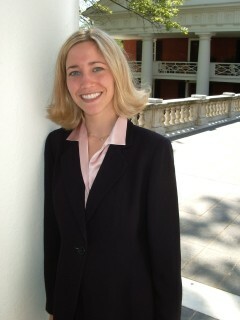 After college, Lauren attended law school at Pepperdine University. She currently works at Washington & Lee University in Lexington, VA.